While on a trip to scout out a location for another franchise, the Cosentinos stumbled upon a Krispy Kreme Doughnuts store. 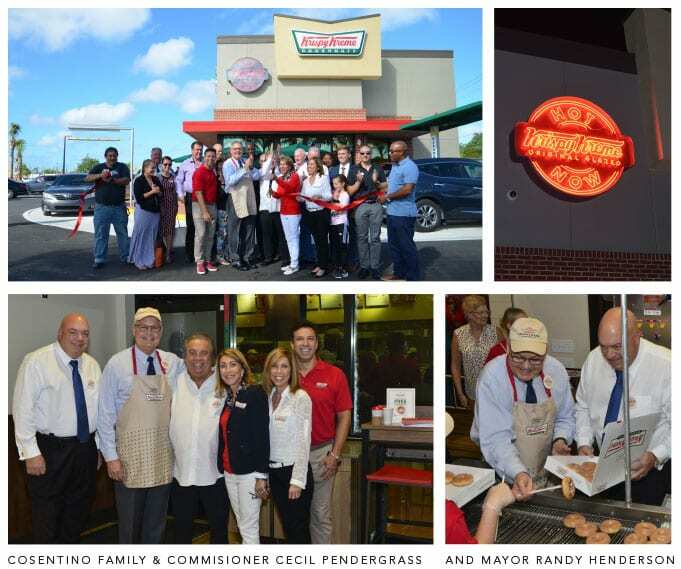 Upon trying the one-of-a-kind “hot” original glazed doughnut for the first time, the heavens parted and they heard a voice say, “You must open Krispy Kreme franchises everywhere.” Three years later, they opened their first Krispy Kreme in Miami. Today, they own and operate nine locations from Miami to Palm Beach. How they broke into the Fort Myers market is quite a story. “Where should we go next?”, they asked themselves. Southwest Florida was the answer! With little knowledge about Fort Myers and having minimal connections, the family wanted to partner with a local firm to help generate excitement and build momentum leading up to the grand opening of their first local store. Based on the recommendation of the developer and the mayor, the Cosentinos reached out to Spiro & Associates to help market and promote their entry into our marketplace. It didn’t take any arm twisting from our CEO to get the Brand Architects™ excited about this project. Rumor has it, he offered to work for doughnuts… mmm doughnuts. Our eyes glazed over with excitement about the opportunity. We went to work immediately to develop and execute an integrated communications campaign that would raise awareness of the new location, build a local following and drive traffic to the new store. Knowing there are throngs of doughnut lovers on social media, the Agency collaborated with the Cosentinos, a.k.a the Fort Myers Doughnut Operations team, to leverage posts on Facebook to attract followers and get them drooling over the possibility to be among the first to taste a locally made “hot now” Krispy Kreme classic. 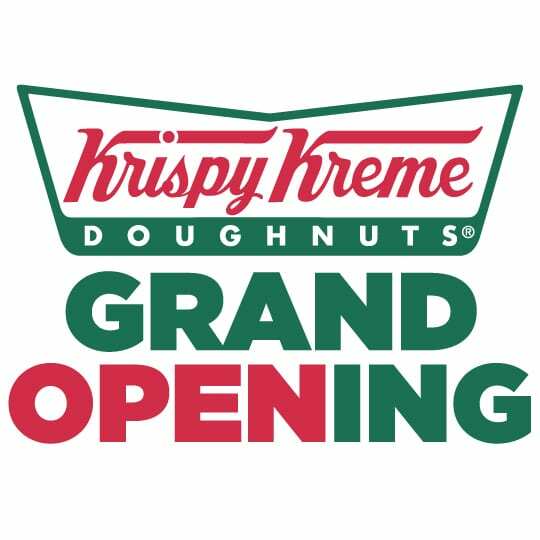 The Brand Architects collaborated with two local influencers who started a Facebook page “Bring Krispy Kreme to Fort Myers.” The page has 2.2k followers, which helped round out efforts in spreading the word and excitement about the new location and opening day festivities. The most exciting post of all was how one lucky doughnut-craving groupie could win free doughnuts every week for a year. This only created even more of a frenzy for the Grand Opening. 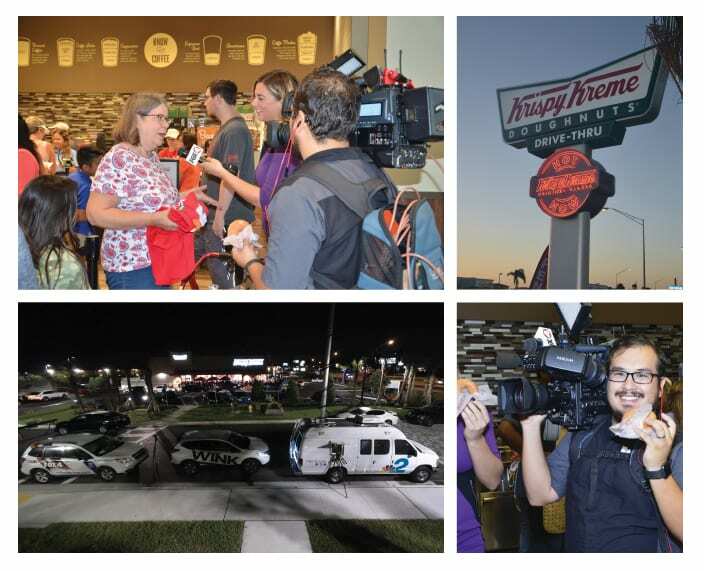 The Agency’s public relations SWAT team promoted Fort Myers Doughnut Operations through press releases, media alerts and feature story pitches. 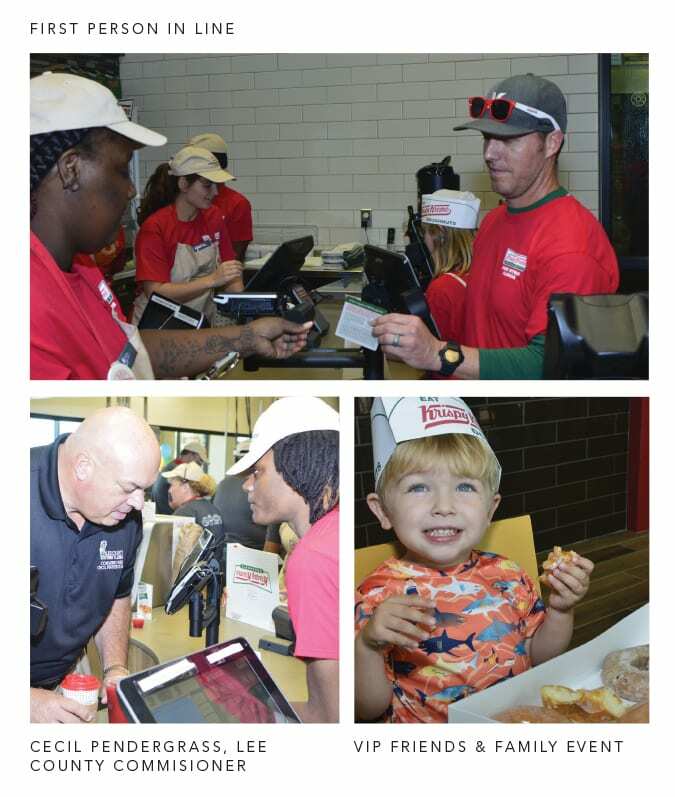 We gave print, television and radio personalities the sugary opportunity of interviewing key franchise team members and to tour the retail store prior to the Grand Opening. We provided marketing, promotional support and coordination for “Friends & Family Day,” the Grand Opening and the long awaited ribbon-cutting ceremony. We also enlisted the help of local dignitaries, media representatives and other area celebrities who were eager to abandon their normal routine in favor of smothering their faces in hot, sweet dough and creamy icing. The branded T-shirt we created to commemorate the Grand Opening became the most sought-after keepsake of the event. Only the first 100 customers received them for free and it was also available for purchase. 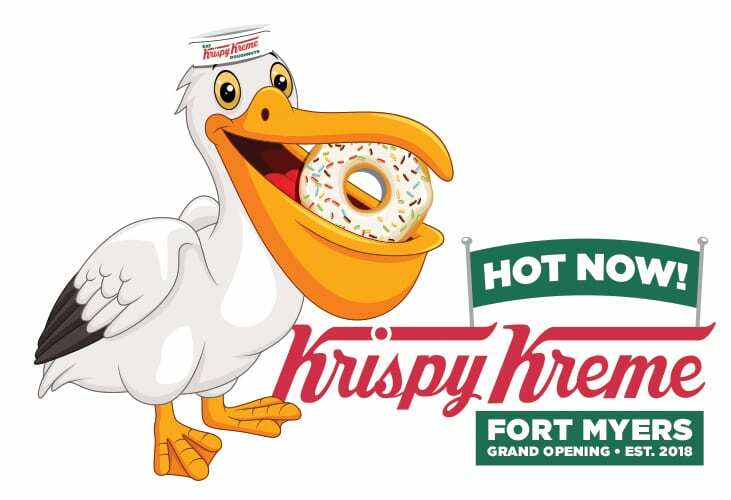 The final design showcased a gray and white pelican clad in a Krispy Kreme side cap with a doughnut in its bill. • Lured over 450 Krispy Kreme fanatics to camp out on the sidewalk and parking lot to be among the 100 winners of free doughnuts for a year. Crowd of 650 by doors opening. • Rewarded Mayor Henderson with the honor of officially turning on the “Hot Now” light clad in a Krispy Kreme apron and side cap. • Enjoyed watching Lee County Commissioner Cecil Pendergrass assist Mayor Henderson to assemble the first box of a dozen doughnuts… mmm doughnuts. • Gathered the Cosentino family, Mayor Henderson, former Fort Myers Mayor James Humphrey, Councilwoman Teresa Watkins Brown, Councilmen Fred Burson and Liston Bochette, City Manager Saeed Kazemi, and members of the Lee County Sheriff’s Office for the official ribbon-cutting ceremony sponsored by the Fort Myers Chamber of Commerce. Overall, the campaign was an astounding success. Thousands of people turned out for the Grand Opening and there is no sign of an end to the frenzy and excitement. The Client is overwhelmed with the results and stated that the Fort Myers Grand Opening had the best turnout of all their franchises thus far.